Traktor On The iPhone ~ Gotta Have Noisia! As part of Apple’s celebrations of a millennium as a successful hegemonising swarm, they’ve been giving away apps free. One of these is Native Instruments’ Traktor iOS app. Traktor on the Mac and PC is a fully-fledged, pro-DJ app. I don’t use it when I’m DJing for reasons which I explain at length here. But, whatevs, it’s pretty nifty if you like that kind of thing. I was never into it as the UI always seemed clunky and got in the way of the music. But Traktor on my iPhone is the opposite. Just being able to touch the waveforms and scroll backwards and forwards, no mousey-mousey, takes me back to my vinyl DJing years. Bear in mind, what you’re hearing is just two tracks mixed on an iPhone. Traktor handles the sync and it does it faultlessly, as you can hear. I’m doing nothing apart from starting in the right place and the occasional bit of crossfader stupidness. For me, this experience has been revelatory. I’ve got the demo of Traktor on my Mac: never made a thing with it. Five minutes with the iPhone app and, BOOM, mashup done. Of course, it isn’t flash and my mashup is hardly genre-breaking but it’s quick and easy and, unlike the desktop Traktor, FUN! This is patently the element of the touch screen interface. Even with controllers for Traktor, it’s not as satisfying as grabbing the waveform yourself with your own little fat fingers. 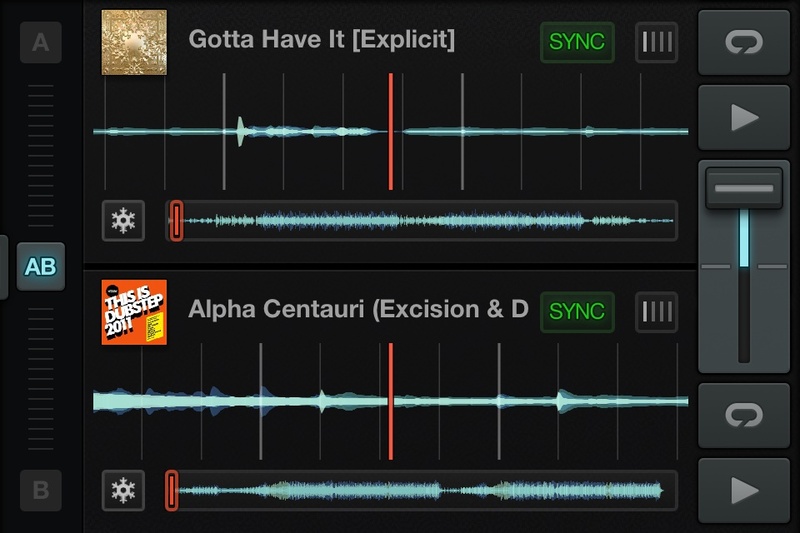 Traktor iOS is light years ahead of the “pro” app. And I think it’s a sign of how the future will see a proliferation of what I call appropriate computing. Rather than assume bigger is always better, sometimes a low-powered, niche computer (which is what an iPhone is compared to my Mac Pro) will serve the task in hand better, particularly if it presents a UI more suited to that task. Now, if you would excuse me, I’m off to try to mash Doris Day with As I Lay Dying. Byeeee!